Technology, and the innovation behind it, moves quickly. It appears that every time we turn around there is a new product, a new system, a new must-have that will revolutionize the way we interact with the world around us and the people in it. The rapid pace at which tech moves makes for exciting times indeed, but there is a little known danger from the quick product turnarounds and constant innovation we have come to expect. In a mounting fight against the toxic e-waste stemming from our increasing number of outdated and discarded technologies, we are forced to question the ethical implications of our dependence on the latest and greatest gadgets. As electronics – computers, televisions, VCRs, stereos or copiers – reach the end of their “useful life,” the issue of how to safely and effectively dispose of their parts, some of which can be hazardous, becomes cause for concern. As an issue that often goes unconsidered, the solution to e-waste is one that depends on education, conversation, and information proliferation. To facilitate conversations about effective and safe disposal solutions for e-waste, Liquid Technology, a full-service IT asset disposition (ITAD) company that offers a complete suite of services designed to help companies manage their hardware assets, introduced The Tech Bench. 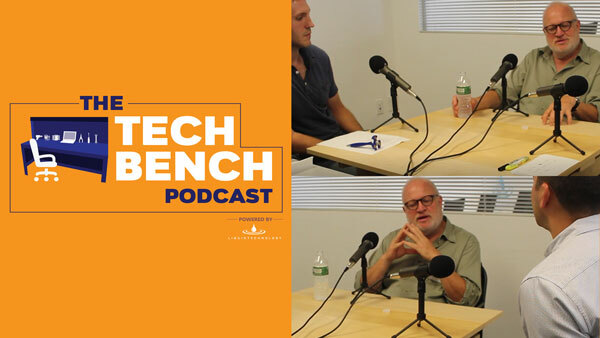 The Tech Bench is an educational podcast that features interviews with experts in the IT industry and surrounding fields. The weekly podcast is designed to tackle topics like cloud infrastructure, e-waste regulation, data destruction, and diversity in tech to stimulate and encourage much-needed conversation about contemporary issues that plague the industries we depend on. In episode one, Liquid Technology featured an interview with Founder and Executive Director of the Basel Action Network (BAN), Jim Puckett. The episode featured insights on the issue of e-waste from Puckett, who has worked for decades in the fight against trading toxic waste. In this episode, he shared how he started in the e-waste industry, why e-Stewards (BAN’s electronic waste recycling standard) is a superior standard, and how the Basel Action Network’s new initiative of using GPS trackers is exposing fake recyclers and so much more. The spark that ignited Puckett’s work was The Basel Convention. Eventually becoming the Basel Action Network’s namesake, the convention is an international treaty designed to reduce the movement of hazardous waste between nations. Signed in 1989, this treaty and the concern for the waste output of wealthy countries being ineffectively and unsafely dismantled in poorer countries became the impetus for BAN’s efforts, including the e-Stewards program, which supports and promotes ethical recycling of e-waste. Puckett shared an anecdote about his travels, describing how they inspired his passion about this issue and sent a shockwave around the world and the industry. He notes his trip to Guiyu in Guangdong Province, China, as being particularly poignant. He remembers “mountains of electronic waste” coming in a constant stream. He describes “truckload after truckload, unloaded on the streets,” all of it being broken down by hand. Not only was it a shocking sight to behold, but toxic runoff and “all kinds of tin and lead fumes” from cooked circuit boards hung in the air, ruined the groundwater and was causing the “most horrific contamination that’s ever been documented” in terms of dioxins and heavy metal contamination. When the local children’s blood was tested, the toxicity was showcased there as well. His narrative highlighted the massive level of devastation, along with its ruinous effects on local populations and ecosystems, noting that this information was being overlooked by American media. To combat the massive scale and widespread unawareness that makes this e-waste issue so lethal, e-Stewards works towards a market solution based on their own high-bar standards. Their method directs conscientious, ethical consumers and big businesses towards the “good guys.” In this case, the good guys are ethical recyclers that are willing to be certified and pledge to handle all waste carefully, not export it, which allows them to gauge the status of trading through real data and reports. This endeavor ensures that the severity of the e-waste issue is not undermined by false reports and misinterpretation of unclear data. The tracker system facilitates solutions by allowing BAN and the e-Stewards to target specific regions and recycling companies that contribute to the problem. The trackers were successfully able to pinpoint problematic junkyards in Hong Kong, and when those junkyards moved to avoid being shut down, the trackers followed them there, too. In this way, the project has continually created pathways for understanding and provided crucial information that has informed the decisions of companies and governments. As a result, some areas are beginning to understand the detriment that toxic e-waste can pose to the surrounding people and ecosystems. Puckett mentions Thailand as being particularly proactive, having recently banned the import of plastic and electronic wastes. The trackers also aid on American soil, where they serve as insurance that e-Stewards companies and other businesses are also practicing the ethical standards they preach. In the case of Dell, the trackers allowed for targeted rehabilitation of their improper recycling habits, which would have otherwise gone unnoticed. Through their branded EarthEye program, BAN helped Dell to realign their ethical practices and keep their environmental partners honest, resulting in a win-win-win situation. In the end, whether it is through a company’s lack of knowledge about where their waste ends up or through blatant disregard, e-waste has proven itself as a widespread issue. BAN, with their network of programs like EarthEye and e-Stewards, are working towards a more transparent, honest and productive relationship between companies and their recyclers. More companies are increasing their awareness and realizing the benefits of maintaining high ethical standards. The Basel Convention stands as the rules of the road when it comes to trade and waste, and they are rigorous. BAN’s high standards, much higher and more thorough than those of the commonly implemented R2 standards, work to create the most harmonious outcome for the world’s workers, companies, and ecosystem. While it may seem an unnecessary cost to some businesses, these entities behind the curve on e-waste standards will find that employing less meticulous regulations will come at a much higher price and on a global scale. America still has miles to go when it comes to effective e-waste management, with so little of our electronics being recycled or repurposed back into commodities. The fight to stem the massive flow of our toxic production into dumps and avoid losing our precious materials in the process, along with the fight to preserve the integrity of our planet’s soil and water, is far from over. As Puckett notes, the U.S. is the “only developed country in the world” that hasn’t ratified the Basel Convention, while European countries like Sweden and Denmark lead the world in environmental protection. Though it may be hard to see where waste trends are headed and what the value of these waste commodities will do to environmental efforts, the Basel Convention and stewardship groups like BAN are working tirelessly to create a better future.